My mane, that's a story all on its own. My hair is long, pin straight, extremely thick and there is just so much of it. Because of the bulk and weight of my hair, it unfortunately lies very flat around my head. My hair is quite strong and can take quite a beating. But with the abusive way I've treated my locks over the last few months, (think ombre then back to dark brown and then bleaching it again just to switch back to a brown a little lighter), it is lacking moisture and just doesn't look so cute. 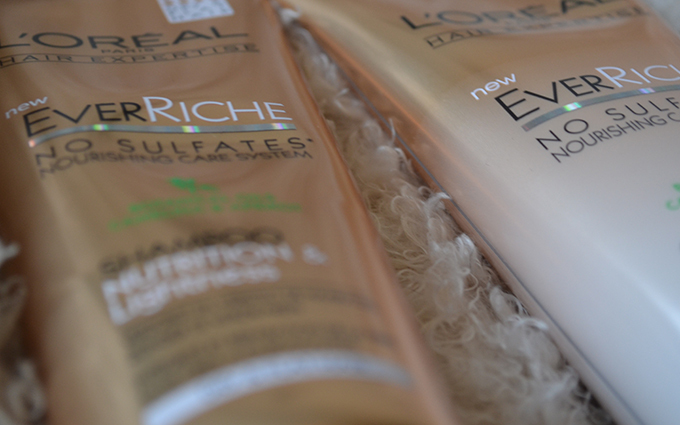 Enter the L'Oreal EverRiche shampoo and conditioning duo. A new edition to the 'no sulphates' range from drugstore superbrand L'Oreal. They have three different sets in this range available in the Netherlands and I decided to try the ones that are designed for dry and flat hair. My hair lacks in volume because of its weight, not because of fine texture. But it is very dry, resulting in easily tangled locks and slightly frizzy ends. I'm in need of a cut as well. 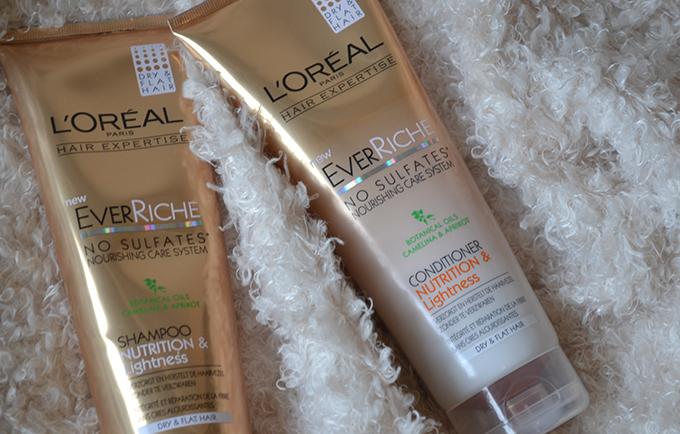 The L'Oreal Ever range claim to have no sulfates, no parabens, no harsh salts and to be 100% vegan. Sulfates are surfactants. They are the chemicals that make your cleanser, shampoo, engine cleaner or car wash soap lather up and produce the signature 'foaming' that you expect shampoos and soaps to do. Sulfates are also used in clinical trials, to purposely irritate the skin in order to measure healing. They don't sound like such a good thing, do they? I avoid the use of sulfates in skin care, but to me it doesn't really matter in hair care. Upon first use I was surprised by the incredibly lovely scent. It smells like vanilla and caramel, but not overly sweetened and artificial, just really nice. I massaged it into my locks and was amazed at the amount of foam. There was no way that this shampoo was sulfate free. I checked the back of the packaging and there is something called sodium lauryl sulfoacetate, which may sound like something super chemical, but is actually derived from natural ingredients, and it does the same as the harsh sulfates. The effect of the shampoo is great. After washing with this combination my hair is soft and shiny, and it feels lovely. It's easy to comb through the first two days, but then it is back to the usual tangles and knots. I think it does a good job at nourishing my hair, but it doesn't make it super voluminous. But I have to admit that is probably impossible because of its weight. I'll keep using this shampoo and conditioner, but I am not promising to go off the market just yet. I'm still on the lookout for something that makes my hair just a little more texturized and awesome.